President Trump says Mexico and Central American countries are not doing enough to stop the flow of migrants. So he has issued this threat. PRESIDENT DONALD TRUMP: If they don't stop them, we're closing the border. They'll close it. And we'll keep it closed for a long time. I'm not playing games. MARTIN: This is not the first time President Trump has sounded that warning. The border in San Diego was shut down for a few hours last year. This time, though, the president hasn't followed through on the threat. Stopping cross-border traffic with one of the nation's biggest trading partners could do serious damage to the U.S. economy. NPR's Scott Horsley reports. SCOTT HORSLEY, BYLINE: Retailers in San Diego got a small taste of what a border shutdown might look like last November, when members of a migrant caravan charged the border and U.S. officials closed one border crossing in response. While that shutdown lasted only a few hours, it came on what should have been one of the busiest shopping days of the year, and fallout for local merchants was severe. LOUIE SALOUMI: I easily, easily lost between $3,500 to $4,500 just that day. HORSLEY: Louie Saloumi runs a churro stand in a large outlet mall just north of the border. Nine out of 10 customers there walk or drive over from Mexico. When that traffic was cut off for less than a day, the hit to the local economy topped $5 million. Saloumi says if the border were closed for a full week, he'd be out of business. SALOUMI: That mall would be a ghost town. HORSLEY: Closing the entire U.S. border with Mexico would also put the brakes on more than $1.5 billion in goods crossing back and forth every day, including 50 million pounds of produce from Mexico that now fills 100 warehouses in Nogales, Ariz. One importer warned the U.S. would run out of avocados in three weeks. But guacamole is the least of it. Lance Jungmeyer, who heads the Fresh Produce Association of the Americas, says fresh tomatoes, peppers, melons and eggplant for the whole country would soon be in short supply. LANCE JUNGMEYER: Probably over half of what most consumers put in their shopping bag when it comes to fresh produce, they would find reduced quantities and higher prices. HORSLEY: Jungmeyer says the administration's already planning to halt truck traffic through Nogales on Sundays as customs officers, who typically staff the border crossing there, are reassigned to deal with the influx of Central American migrants. If that shutdown extends to other days of the week, Jungmeyer worries some people will be out of work. JUNGMEYER: There's jobs that depend on moving goods back and forth every day. And if that's not moving, those people are laid off. And that means those people are not able to keep the lights on in their own homes and put groceries in their own refrigerator. So it gets really dicey really quick. HORSLEY: And those effects are not limited to the border region. Mexico's a critical supplier for companies throughout the U.S., especially in the highly integrated auto industry. KRISTIN DZICZEK: We don't just trade with each other. We're making things together. HORSLEY: Kristin Dziczek of the Center for Automotive Research says Mexico supplies 37 percent of all imported car parts in the U.S. and more than 70 percent of some critical components. Dziczek says because some of those parts are central to a car's assembly, without them, factories would soon grind to a halt. And that, in turn, would idle domestic parts makers. DZICZEK: We'll see auto production in the U.S. shut down pretty quickly. Some within hours, and certainly, the whole industry within days. HORSLEY: Dziczek says the fallout from a complete border shutdown would be so fast and so sweeping, it's hard to take the president's threat seriously. But White House counselor Kellyanne Conway insisted on "Fox News Sunday" it's a real possibility. KELLYANNE CONWAY: It certainly isn't a bluff. You can take the president seriously. 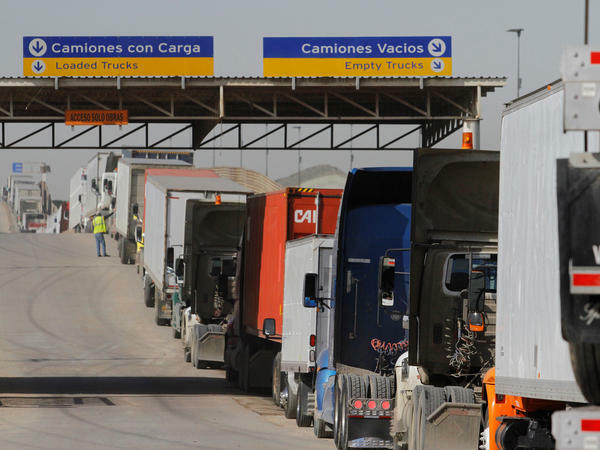 HORSLEY: Companies throughout the U.S. routinely make contingency plans for supply disruptions, but it's impossible to prepare for something like a complete border shutdown. If the worst does happen, Dziczek jokes she does have one consolation, a stockpile of tequila that can last for a while.